Hokusei is one of those artists about whom almost nothing is known other than the fact that this artist was also known as Shunshisai Hokkai. The Edo kabuki star Iwai Shijaku who specialized in onnagata roles, on tour in Osaka here starring as Ohatsu in the play Tsugiawase Koshiji no Ume at the Kado theatre in 4th month 1834. 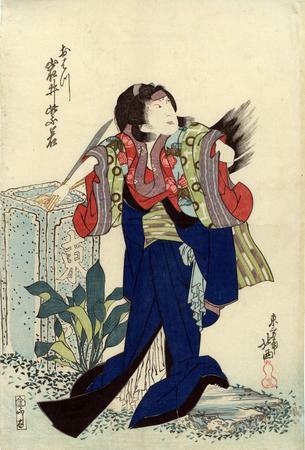 Dean J. Schwaab in Osaka Prints (page 155, #149) illustrates the later, commercial edition of this design with an orange kimono; but without the artist's seal and without the silver pigment on the short sword blade. Illustrated in Osaka-Holzschnitte by Hendrick Lühl, p. 98. 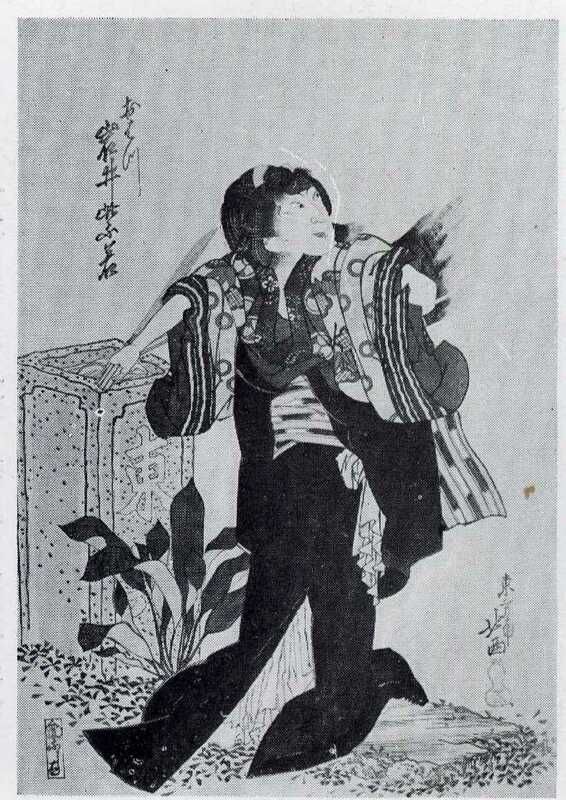 Also illustrated in Ikeda Bunko, Kamigata yakusha-e shūsei, vol. 2, Osaka, 1998, No 414. The Museum of Fine Arts in Boston says that the title of the play represented in this print is Tsugiawase Koshiji no Ume.